Zobmondo!! Would You Rather takes the idea of parlor game questions to a new level of debate and lunacy. WOULD YOU RATHER have five bottles stuck on the fingers of one hand for a year -OR- a bucket stuck on your foot for a year? "Neither" is not an option here! No matter how awful the alternatives are, it's up to the group to reach a consensus. Read the "would you rather" question, then let the conversation and laughter rip. Discuss and debate the mind-boggling options and see just how long it takes you all to agree on the absurd! To win, you must move around the board by correctly predicting the group consensus to each of your questions and complete three of the even more absurd "would you rather" challenges. Would you rather...Age only from the neck up-OR-age only from the neck down? 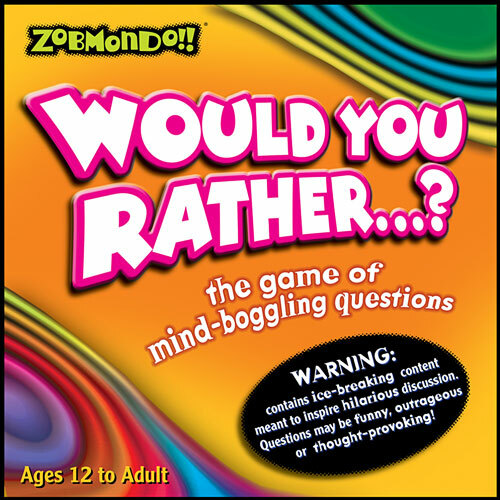 In this version, you'll find questions that are ethical, bizarre and mind-bending, but each is a field-tested conversation starter that is guaranteed to provoke ridiculous fun, break the ice at any party, and if played correctly open a unique window into the wild imaginations of friends and family! Number of Players: 4 or more players. Ages 12 to Adult. Playing Time: 45 or more hilarious minutes. 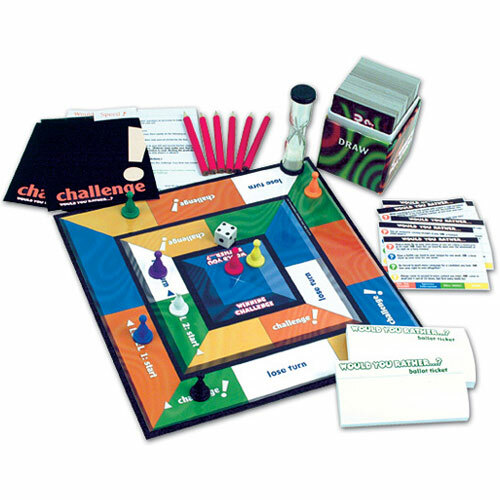 Features: 800 "Would You Rather" questions Includes game board, player pieces, dice, sand timer, card, score pads and pencils Award winning social party game for families or teens. Recommended for ages 12 to Adult. 4 or more players. Measures approximately: 3.38 x 10.25 x 10.25 inches..